It is my great pleasure to represent our Board of Presidents and the whole staff at ULIS-VNU to attend and deliver a speech at the Commencement Ceremony of Master of Science in Teaching English as a Foreign Language (TEFL) for students of Cohort 25. 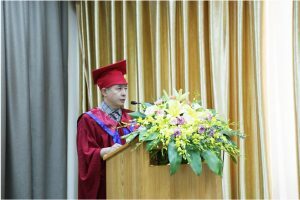 The University of Languages and International Studies, Vietnam National University, or ULIS-VNU, has got more than sixty years’ experience in teaching and research on foreign language education as well as international studies. For Post Graduate programs on foreign languages and language teaching, ULIS-VNU is the most experienced institution in Vietnam, with numerous contributions recognized by the whole society. We have educated thousands of people at master and doctoral levels to serve the Vietnamese society and develop our country effectively. In harmony with Vietnam’s integration trend in the recent years, ULIS-VNU has promoted cooperative activities and joint programs about research, education and services related to these issues in order to meet the demand of our society. Among those activities and programs, the joint programs in cooperation with prestige universities in the world are a crucial part and have been enhanced. The joint training program between ULIS-VNU and the Southern New Hampshire University on Master of Science in TEFL was first launched in 2007. Up to now, there have been 521 students attending this program. As all the students here have learnt and conducted research in this joint training program between the two prestige universities in Vietnam and in the USA, we believe that all of you have been provided with the best conditions for your professional development and research skill improvement. We understand that the recent two years is not an easy period for you due to the demanding subjects, specialized reports. This is even more challenging when most of the students here have to take responsibility of all their office job and their family work while trying to ensure their time for the course requirements. Therefore, we highly appreciate the efforts of all students in this master program. We sincerely congratulate the 14 students who have successfully completed the courses to become the graduates in the commencement ceremony today. We expect that all the knowledge and skills you have gained in this course will become an important companion to support you in your own careers and contributions to the education in Vietnam. On this occasion, we would like to send our heartfelt gratitude to all the authorities at Ministry of Education and Training and Vietnam National University. Without your supports we wouldn’t have got the proper conditions to implement the program successfully. We also show our deep thanks to Southern New Hampshire University for your friendly and rigorous cooperation with us in the joint training program. I would like to express special thanks to all teachers of both universities for your teaching, guidance, evaluation and feedback on the students’ learning, conducting Practicum course. Your support is crucial for the students to complete their missions in this course successfully. Besides, we also highly appreciate the great efforts, conscientiousness and enthusiasm of the offices at both universities who hold direct relations to the program, especially the Faculty of Graduate Studies at ULIS-VNU. We hope that you will all continue trying and cooperating so that our joint training program will gain more and more accomplishments. Once again, I would like to show my heartfelt congratulations to all the new master graduates here. Wish all the distinguished guests, the faculty and staff, the new masters and their family members health, happiness and success.